Whether you’re about to install a new California Closets system or simply want to maintain a clutter-free storage space, it’s always a good time to give your closet an organizational makeover. Evaluating your closet a couple of times a year allows you to purge items you no longer need and continuously make your space as efficient as possible. This will allow you to always find what you’re looking for, and only clothing you truly love will fill your closet. Plus, regularly embracing this process actually helps curb impulse buys when you’re out shopping. Follow these thoughtful tips on organization from our experts to create the most streamlined closet you’ve ever had. Take everything out: While it might sound overwhelming to clear out your entire closet, this step is indeed integral to the organization process. Take every — yes, every — item out, including clothing, accessories and shoes. This encourages you to be a bit more discerning about what you put back into your closet. Divide your items into three groups: Sort through the contents of your closet and create three piles: one for items to give away or consign, one for sentimental items that you can place in long-term storage, and one for items that you wear regularly and definitely want to return to the closet. As needed, try on your clothes to help you decide where they belong. Anything that doesn’t fit, or you rarely wear, is ready for retirement. 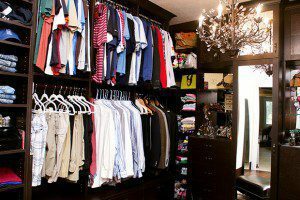 Add garments back in: Once you’ve sorted your clothes, address the garments that are staying in the closet by grouping them into categories. Start by putting your shirts together, separated by short sleeve and long. Then, divide your pants, dresses, skirts and so on by casual and more formal, long and short. Use this process for each category of clothing. Once you have your categories defined, you can put everything back into the closet in sections, leaving a few inches of room between each one. If you’re feeling extra ambitious, arrange items within the sections by color. Make space for shoes and accessories: These should be the last items you place back in your space. Ideally, if you have adjustable countertop shelves, you can create a full section dedicated solely to shoes. The best place to set your shelves is at eye level, which makes it much easier to find the pair you’re looking for when you’re getting ready. You could also use a shelf above your clothes for shoes. 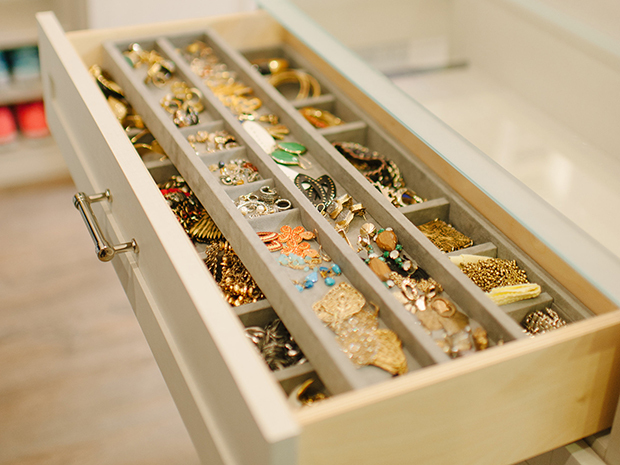 Accessories, such as purses, ties and jewelry, should be placed on designated shelves or specialty racks so that each item can be accessed and put away neatly. 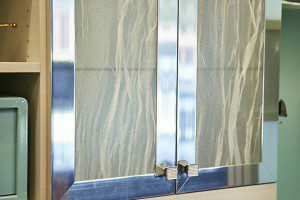 Once your system is installed and ready for use, you’ll want to properly maintain it. Our systems are designed to remain flawless for years to come with a little regular upkeep and the right cleaning products. Sometimes, what you see is what you get. This was the case with the Merediths—they needed more room in their closet, but didn’t want to pare down their belongings or move walls to create a bigger space.